Included in The Spectator's Lead Book Review: Did the hideous carnage of Passchendaele gain the Allies anything? Chosen as the Forces War Records' August 2017 Book of the Month! Chosen as Best of British magazine's September 2017 Book of the Month! You'll be £14.99 closer to your next £10.00 credit when you purchase The Road to Passchendaele. What's this? 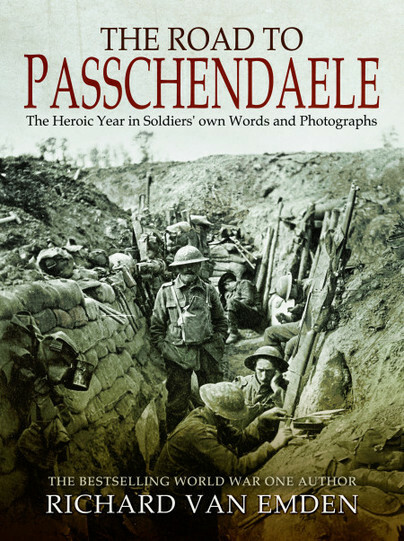 Passchendaele is the next volume in the highly-regarded series of books from the best-selling First World War historian Richard van Emden. Once again, using the winning formula of diaries and memoirs, and above all original photographs taken on illegally-held cameras by the soldiers themselves, Richard tells the story of 1917, of life both in and out of the line culminating in perhaps the most dreaded battle of them all, the Battle of Passchendaele. His previous book, The Somme, has now sold nearly 20,000 copies in hardback and softback, proving that the public appetite is undiminished for new, original stories illustrated with over 150 rarely or never-before-seen battlefield images. The author has an outstanding collection of over 5,000 privately-taken and overwhelmingly unpublished photographs, revealing the war as it was seen by the men involved, an existence that was sometimes exhilarating, too often terrifying, and occasionally even fun. Richard van Emden interviewed 270 veterans of the Great War, has written extensively about the soldiers' lives, and has worked on many television documentaries, always concentrating on the human aspects of war, its challenge and its cost to the millions of men involved. This book will be published in June 2017, in time for the 100th anniversary of the epic Battle of Passchendaele which began on 31st July 1917 Richard van Emden’s books sold over 650,000 books and have appeared in The Times’ bestseller chart on a number of occasions. He lives in West London and regularly appears on television, mostly recently as BBC1’s historian for the national commemorations of the Somme Battle. He has appeared on over forty television documentaries and has written nineteen books on the First World War. Van Emden himself is nothing more than a fleeting presence throughout, offering a few paragraphs here and there to give a background to the events as they unfolded, leaving the troops themselves to tell the story – and it’s that that makes the book so compelling. What’s more, the author has unearthed a rich catalogue of photographs taken – often illegally – by frontline personnel; there’s no whitewashing of events here, or skirting around issues, they’re brought to the fore in moving and occasionally disturbing detail. The Road to Passchendaele: The Heroic Year in Soldiers' own Words and Photographs" by First World War historian Richard van Emden draws upon diaries and memoirs, as well as original photographs taken on illegally held cameras by the soldiers themselves to tells the story of one of the bloodiest conflicts of 1917 known as the Battle of Passchendaele. van Emden draws from his outstanding collection of over 5,000 privately taken and overwhelmingly unpublished photographs, revealing the battle as it was seen by the men involved, an existence that was sometimes exhilarating, too often terrifying, and occasionally even fun. Published in time for the 100th anniversary of the epic Battle of Passchendaele which began on 31st July 1917, "The Road to Passchendaele" is a timely and timeless contribution to the growing library of World War I histories and memoirs. Unlike many other works where personal accounts are used, in this excellent volume they comprise the bulk of the narrative and the author uses a very light touch to keep the narrative flowing through. This has been done using two different fonts, which works exceptionally well and allows the reader to see immediately who is narrating the passage they are reading. Many of our readers will be familiar with Van Emden's work and his style and authority when writing on the subject. I felt this was one of his best volumes to date, allowing the men to tell their own story. The stories in this book resonate and are so poignant, whilst the accompanying visual photographs are mind blowing. The author has established a reputation for detailed knowledge of the Great War and has interviewed more than 270 veterans, writing seventeen books on the subject. An excellent account that makes great use of the actual words of the survivors of a campaign that epitomizes the Great War. These words are accompanied by a wealth of images that span the stages of the campaign – Highly Recommended. Lavishly illustrated and well-written this is an ideal place for the Passchendaele novice to start.